eWater Systems supply sustainable hygiene system that uses salt water electrolysis to replace harmful chemicals at a lower cost, more safely and with zero impact on the environment. These systems are often specified to meet the Green Cleaning Protocols within the various building standards including Greenstar, WELL or LEED. The most recent addition to these standards is the WELL Building Standard, with criteria focused on the building design, build and supply to ensure a healthy environment for the wellbeing of its occupants. Its comprehensive criteria require evidence of materials compliance to specifications and standards, and in situ scientific testing. eWater has gained acceptance by the IWBI as an approved alternate pathway (AAP) within the Green Cleaning protocol. This acceptance ensures that our product contributes to credits in several of the standard features including AIR, WATER and NOURISHMENT. eWater technology produces solutions on demand, insitu for use in food production and service, along with a broader application in facility cleaning. This frees operators from the costly chemical supply chain of packaged chemicals. This feature is considered to go above and beyond the WELL requirements and as such Electrolysed water is also recognised as an innovation feature under the standards. The eWater Hygiene System has been commissioned in Lendlease’s new development - 25 King Street in Brisbane. 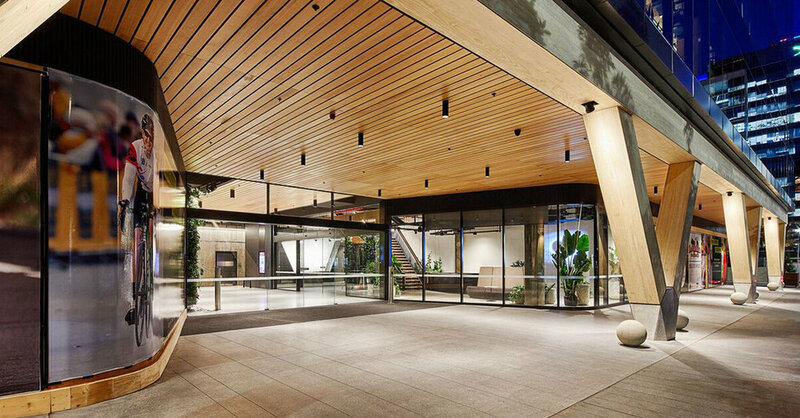 As the largest and tallest engineered timber office building in Australia, it is setting new standards in environmental and socially sustainable workplaces. eWater has been installed and will be used to clean the interior of the building. Clean air is a critical component to our health. The reactions people have to air pollutants vary widely and depend on multiple factors including the concentration of the contaminant, the rate of intake and the duration of exposure. Pollution source avoidance, proper ventilation and air filtration are some of the most effective means of achieving high indoor air quality. The WELL Building Standard® expands upon these requirements and provides an approach that combines the installation of appropriate materials with the implementation of effective protocols to regularly disinfect targeted areas. The WELL Building Standard® seeks to simultaneously preserve our water resource while enhancing its quality for human health in the context of different uses. Therefore, WELL requires a broad initial assessment to evaluate a building’s water source. From there, filtration can be installed to meet the thresholds required for each use. Buildings can continue to perform periodic testing to maintain quality water over time. A variety of social, economic, physiological and environmental factors can affect individual dietary behaviors; the built environment is one of them. Distance and access to grocery stores and other places that have fresh fruits and vegetables, access to farmers’ markets, the use of behavioral economics in cafeterias, increased availability of healthy foods and reduced marketing and availability of unhealthy foods, provision of caloric information and many other strategies can have an effect on our food choices and overall dietary patterns. The WELL Building Standard® recognizes this and seeks to implement design strategies and policies. The indoor environment should be a place of comfort. In pursuit of that vision, the WELL Building Standard™ focuses on significantly reducing the most common sources of physiological disruption, distraction and irritation and on enhancing acoustic, ergonomic, olfactory and thermal comfort to prevent stress and injury and facilitate comfort, productivity and well being. The WELL Building Standard™ recognizes the features of the built environment and identifies workplace policies that can be implemented to positively impact mood, sleep, stress levels and psycho social status in order to promote and enable overall occupant health and well being. Innovation Features (goes above and beyond the current requirements of the standard). eWater Hygiene Systems provide an effective solution to reducing both chemicals and their associated costs from buildings, all while supporting the health and well-being of the occupants, operators and the wider environment that we live in. Our systems offer a robust and flexible solution for specifiers and operators alike, designed for commercial use and available in both a standalone and reticulated system configuration. eWater Systems provides dedicated and specialist support for specifiers who are looking to add systems to their projects. This includes qualified support in hydraulic engineering, electrical, installation, commissioning and ongoing operator training. For long term confidence in the system, preventative maintenance and training program are available to support building and facilities operators. eWater Systems have been installed in over 350 site across Australia including new developments and retrofit installations. We are regularly specified into new developments including the current Lendlease Barangaroo Development among many others. For more information regarding WELL or specification information. Newer PostCan the Sustainable Melbourne Fund support your business upgrades? Older PostElectrolysed Water: A natural alternative for removing chemical residue on food.